NAPD's Racial Justice Committee formed in 2016 to specifically tackle issues related to racial disparity and discrimination in the criminal and juvenile justice systems. The Committee exists of more than 90 members, so only Committee Co-Chairs and Committtee Chairs are listed below. The Committee Co-Chairs are Jeff Adachi, Keir Bradford-Grey, Derwyn Bunton, Amy Campanelli and James Williams. To join the Racial Justice Committee or any of its subcommittees, please email Ernie Lewis. There are three Committee Subcommittees: Outreach (chaired by Trish Hubbard); Racial Justice Litigation (chaired by Andre Vitale); and, Cultural Competency Training (chaired by Nikki Trautman Baszynski). 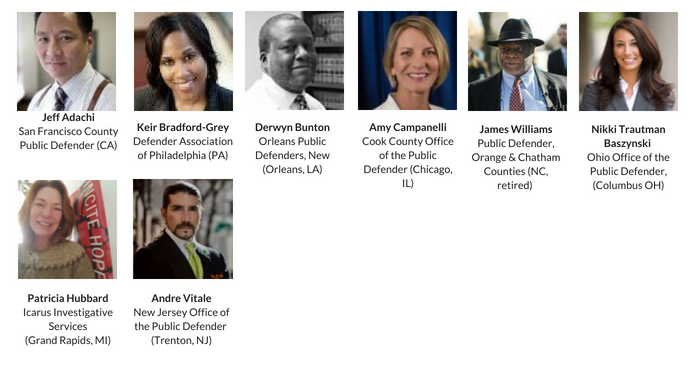 The Mission Statement of the Trial Litigation Subcommittee is as follows: The subcommittee will aim to challenge racial bias at every step of the criminal justice system: from policing, to arrest, to prosecution, through sentencing and beyond. In order to fulfill this goal, the subcommittee will collect resources and materials on racial bias in the criminal justice system, partner with similar organizations where appropriate, develop litigation strategies for use by public defenders across the country, develop trainings to share the litigation strategies, engage researchers who can support the work of the subcommittee and work with the other subcommittees to further the mission of the racial justice committee. The ultimate goal of the subcommittee is to give public defenders the tools necessary to bring to the attention of judges, prosecutors and juries the ways in which racial bias disadvantages our clients and to counter that bias to ensure that the criminal justice system is color blind. The Mission Statement of the Outreach Subcommittee is as follows: to establish a meaningful on-going relationship with public defense professionals, community groups, organizations and individuals promoting racial justice on a local and national level. The Outreach Committee will advocate for self-examination and awareness of racial bias and prejudices among all these groups in order to understand ourselves and thus understand others. Outreach will seek to provide educational and networking programs and support for all persons and groups interested in, created for, or involved in racial justice issues. Outreach will seek to understand the needs of each individual Public Defense Professional and their office, community groups and local residents’ needs in order to provide specific legal and other information to all of these entities. Outreach will act as a conduit to promote such educational, legal and other resources as are available through the Racial Justice Committee and NAPD. This Committee will focus on impact in three major areas: Outreach to all public defense professionals; Outreach to the public through public defense professionals; and Outreach to the Media. Media Outreach will promote awareness of the courageous, beneficial, socially and racially just efforts that public defense professionals, community groups and citizens are involved in every day to promote racial justice. Outreach media contacts will also assist public defense professionals, community groups, clients and citizens in calling for action, and will stand with these groups against acts of racial injustice. Outreach will convey that the NAPD and public defense community has abundant information about the effects of institutional racism, as well as racism in communities, client cases and our own lives which perpetuates racial injustice; and that we as NAPD and as public defense professionals will take a key role in exposing systemic injustice. This committee will act to inform the public defense community, the public, community organizations, activists and clients of this: that we as NAPD and public defense professionals will fulfill a role as allies, as resources, and as community partners with the goal of true racial justice. The mission of the Cultural Competency Subcommittee is as follows: The Cultural Competency Training Subcommittee will provide resources to help defenders confront and mitigate their own biases. In reducing our own biases, we aim to better understand our clients' objectives, work more collaboratively with them, and support them in navigating a broken criminal justice system.